Fish are one of the five groups of Vertebrates which also include Amphibians (almost 7,000 species), Birds (over 10,000 species), Mammals (over 4,200 species) and Reptiles (about 8,000 species). All vertebrates have backbones and spinal columns. There are about 58,000 species of vertebrates. Forty percent of all the fishes evaluated in a 2007 survey (3,100 fishes assessed) were classified as threatened by the IUCN in 2007. Fish can be found in nearly all aquatic environments, from high mountain streams to the deepest oceans. There are over 32,000 species making them by far the largest group of vertebrates. Fish are aquatic animals. Most have streamlined bodies for fast swimming, are covered with scales with two sets of paired fins, have gills throughout their lives (to extract oxygen from water), several unpaired fins and lay eggs. Most fish are "cold-blooded", or ectothermic, allowing their body temperatures to vary as ambient temperatures change. There are exceptions to all of these. 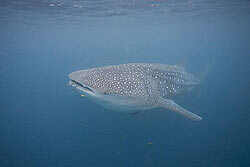 Fish range in size from eight millimetres (stout infantfish) to 16 metres (whale shark). A whale shark can weigh 14 tonnes and can swim at up to 8 or 9 kph.. Many aquatic animals commonly known as "fish" are not fish in according to the definition above including shellfish, cuttlefish, starfish, crayfish and jellyfish. Fish are divided into three basic groups which include Cartilaginous fish, Bony fish (over 29,000 species) and Lobe-finned fish. In some classification systems, Bony fish are divided into two groups - the Ray-finned fish and the Lobe-finned fish. Lampreys and hagfish are often classified into a separate group called the Agnatha. Cartilaginous fish (around 970 species) have a skeleton made from cartilage. Cartilaginous fish include sharks, rays, skates and chimaeras (ghost sharks). Bony fish (also known as Ray-finned fish) are the largest of the three groups of fish with almost 27,000 species such as salmon, trout, lanternfish, cavefish, cods, anglerfish, tarpon, herrings, electric eels and many more. Bony fish have a skeleton made of bone. Lobe-finned fish are a group of bony fish that have paired fins supported by fleshy lobes with bones. Ancient lobe-finned fish are thought to be the ancestors of the first four-legged land vertebrates. There are only eight species of lobe-finned fish in existence now including lungfish and coelacanths. The jawless fish (or Agnatha) include lampreys and hagfish. There are about 100 species. They do not have jaws, scales, a stomach or paired fins but have an embryonic vertebral column (notochord) for their entire lives and a skeleton made of cartilage. Skeletons made from cartilage are tough and flexible and allow fish to grow to large sizes and to swim quickly. Most fish are covered with scales, some species are covered by scutes (an external shield-like bony plate). Others have no outer covering on the skin. Most fish are covered in a protective layer of slime (mucous). The slick layer of slime allows a fish to move faster through the water. It fills up the tiny spaces between the scales to make the fish more streamlined. The slimy surface helps to suffocate pathogens or parasites trying to enter through the fish's scales. The mucous also protects any open wounds from further damage and lets the fish slip through barriers easily. The slime level also affects how much water the fish can take in and out -- a thinner slime layer allows more water in and out of the fish's body and a thicker slime layer allows less. deep-sea fish's tubular eyes pivot under a clear dome.